The right fundus shows focal retinal whitening along the inferotemporal arteriole and blurring of the optic disc margins. The yellow “glow” surrounding this is an associated exudative retinal detachment. The left fundus was normal. A 33-year-old female was urgently referred for blurred vision in her right eye for three days. A 33-year-old Caucasian female presented to her optometrist complaining of blurred vision in her right eye for three days. Preceding this, she had felt lethargic for three weeks with malaise and mild gastrointestinal symptoms. Her optometrist noted retinal whitening (Figure 1) and referred her immediately for a further opinion. Past ophthalmic history was unremarkable. She had no medical conditions and was not taking any medications. Her brother was known to have lost vision from an unspecified form of uveitis. Visual acuities were 6/9 in the right eye (OD) and 6/6 in the left eye (OS). Intraocular pressures were 24mmHg OD and 12mmHg OS. There was a right relative afferent pupillary defect (RAPD) and reduced colour and brightness appreciation in that eye. The anterior chambers were quiet. 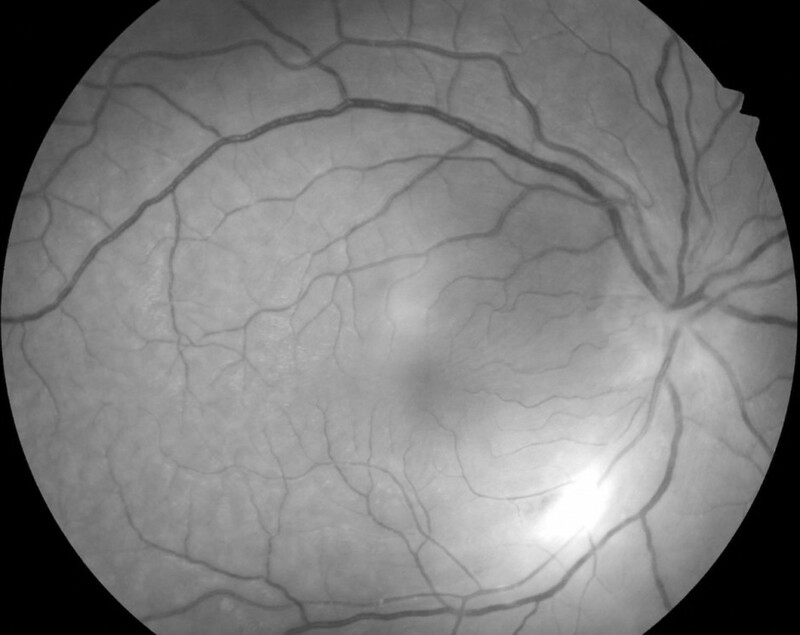 Dilated fundus examination revealed an area of whitening along the right inferotemporal retinal arteriole associated with a swollen optic disc and exudative retinal detachment. There was minimal vitritis. The left fundus was normal. The mother of two young children denied owning or being scratched by a cat. She was unaware of any recent tick bites and did not eat raw meat. She did not suffer arthritis, recurrent mouth or genital ulceration, skin rashes or headaches. 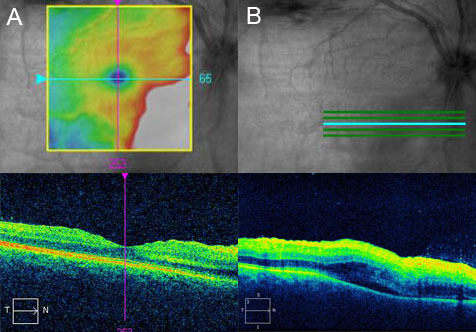 Red free imaging more clearly delineated retinal folds and patchy sheathing of the affected arteriole (Figure 2). Optical coherence tomography (OCT) (Figure 3) showed the retinal surface wrinkling (retinal folds), intraretinal oedema, intraretinal and subretinal fluid. The fovea was relatively spared. 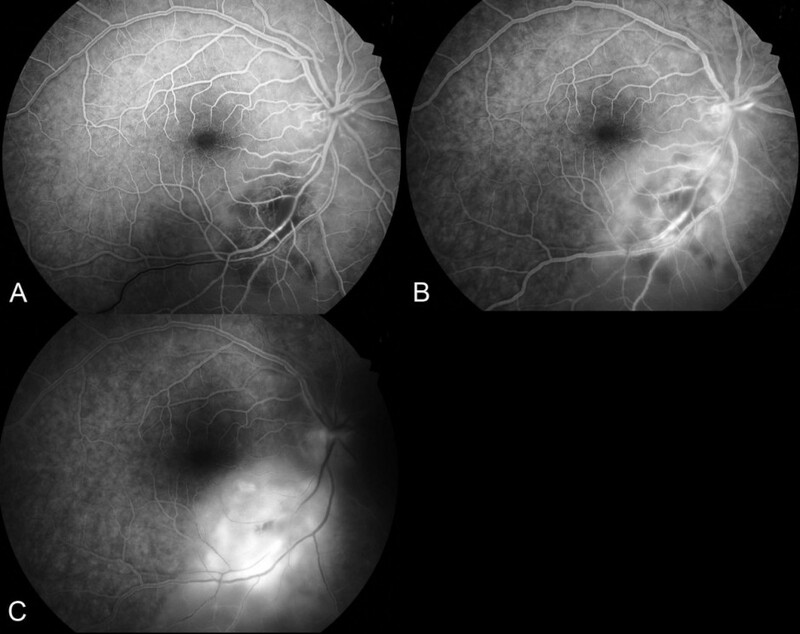 Fluorescein angiography showed focal retinal ischaemic vasculitis, an impending inferotemporal vein occlusion and the extent of the exudative retinal detachment (Figure 4). 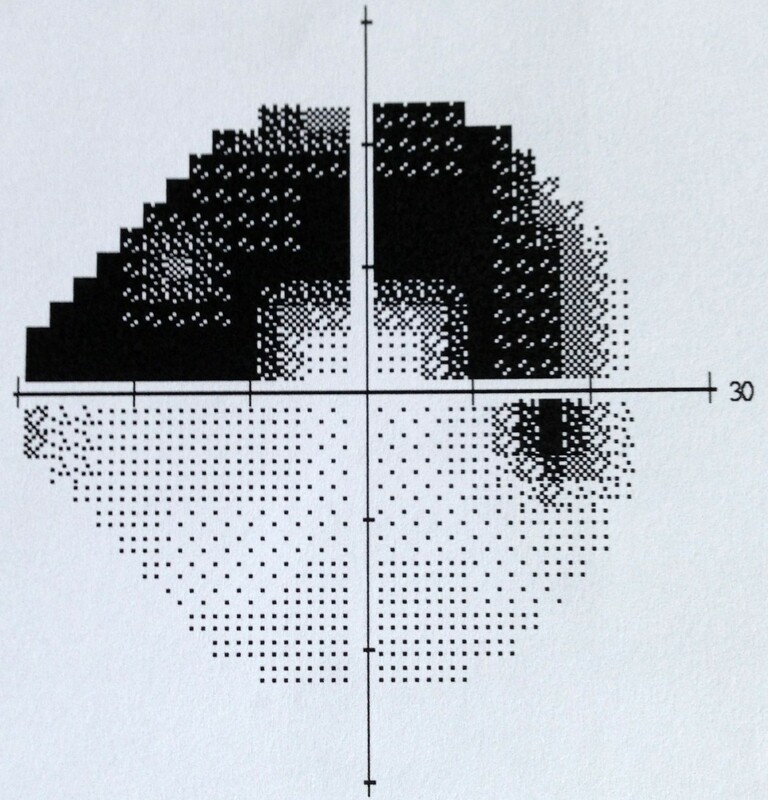 A Humphrey visual field test showed a dense superior field defect in the right eye (Figure 5). Red free photograph highlighting retinal folds pointing toward the fovea, focal retinal whitening and early perivascular sheathing. A) OCT through the fovea shows retinal surface wrinkling and thickening of the inner retina nasal to the fovea. B) OCT inferior to the fovea shows inner retinal thickening with poor layer definition, intraretinal and subretinal fluid. Fundus fluorescein angiogram: A) In the venous phase the distinct area of hypofluorescence surrounding the arteriole represents retinal ischemia. There is a delay in filling of the inferotemporal vein. B) In the mid-phase, vasculitis (hyperfluorescent vessel walls) is seen. C) In the late phase there is hyperfluorescent leakage as the dye fills the subretinal space. Humphrey visual field SITA-FAST 24-2 protocol demonstrates a dense superior field defect in the right eye. 1. Vitreous tap – sent for polymerase chain reaction (PCR) testing for toxoplasmosis, herpes Simplex 1 and 2, herpes zoster, cytomegalovirus, bacterial culture and microscopy. 2. Blood tests – blood counts, vasculitic screen, infectious serology (including syphilis, lyme disease, Bartonella henselae and toxoplasmosis). 3. Neuroimaging – MRI brain and orbits. Acute ocular toxoplasmosis with optic neuritis, arteritis, retinitis and serous retinal detachment. Empirical treatment was initiated with an intravitreal injection of foscarnet and oral clindamycin, azithromycin and valacyclovir. The area of retinitis spread rapidly toward the fovea and the patient was admitted for intravenous acyclovir treatment and oral prednisone. Once toxoplasmosis had been identified as the causative agent by PCR on the vitreous sample, the treatment was tailored to include only clindamycin, pyramethamine, sulphadiazine and prednisone. The patient required ongoing active treatment for several months before the exudative detachment and area of retinitis started to stabilise. Unfortunately sulphadiazine had to be ceased due to a severe adverse drug reaction, Steven Johnson syndrome. The visual field defect was permanent, but fortunately the central fovea was spared and the central visual acuity preserved. The ‘classic” clinical presentation of ocular toxoplasmosis is that of a unilateral, single, focal, elevated white area of chorioretinitis adjacent to a pigmented chorioretinal scar.1,6 Vitritis may be present in variable degrees and when severe, the appearance of the area of active retinitis through the vitritis is that of a “headlight in the fog”. Acquired lesions tend to be unilateral, discrete and solitary. Central location and bilaterally suggest a congenital aetiology, although congenital forms can also be unilateral.1 The disease starts in the inner retinal layers and spreads to involve the deeper retinal layers and the choroid as the disease progresses. The anterior chamber can exhibit granulomatous or non-granulomatous keratic precipitates and cells. The minimal degree of vitritis, optic nerve involvement and exudative retinal detachment in the presented case are atypical features of OT. The prodromal symptoms and the absence of a pigmented retinochoroidal scar suggested a primary infection rather than a recurrence or reactivation of a congenital lesion. Ocular toxoplasmosis can be difficult to differentiate from other causes of posterior uveitis, especially if overlying vitritis obscures the retinal view. 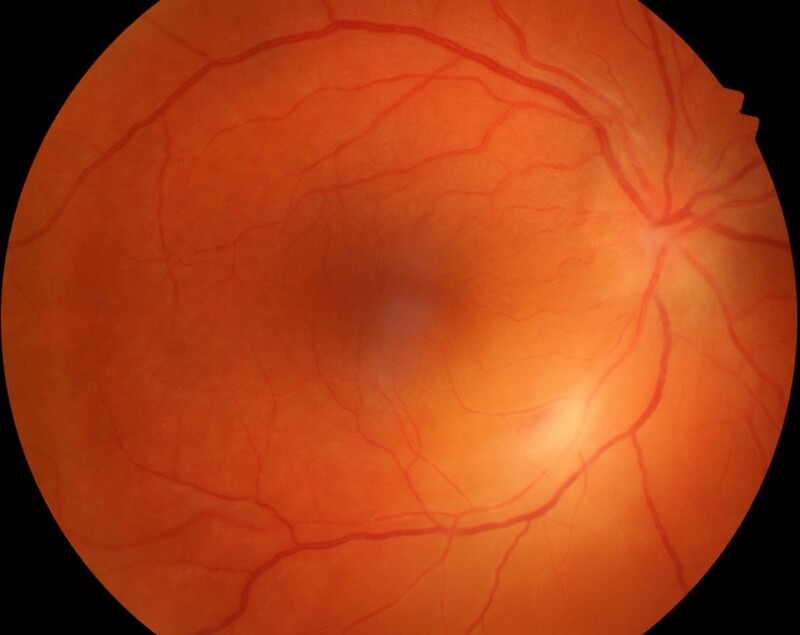 Retinal whitening in the distribution of the retinal arteriole can sometimes appear as a branch retinal artery occlusion.7 It is important to exclude retinitis caused by the herpes viruses or at least treat empirically if in doubt. A detailed history should be taken to explore the possibility of Lyme disease (tick bites), cat scratch disease (Bartonella henselae) and systemic disease. It is also important to determine if the patient is immunocompetent or immunocompromised as this has implications for diagnosis and treatment. The ability to obtain an accurate diagnosis in cases of posterior uveitis has been greatly enhanced by polymerase chain reaction (PCR). It is a sensitive and extremely specific test.6 Vitreous sampling with PCR testing for toxoplasmosis is now a primary diagnostic technique which is particularly useful in cases that do not present with the classic clinical appearance.8 Blood serology plays little role in the diagnosis of OT, due to high seropositivity in most communities, but can be useful in excluding toxoplasmosis as a cause of posterior uveitis. Specific Toxoplasma IgG antibody appears within 1-2 weeks of an infection and remains detectable for the lifetime of a patient.6 Specific IgA or IgM antibodies have a limited role in determining if there has been a recent infection. Treatment of OT is controversial. The disease is self limiting over a period of weeks to months in immunocompetent individuals. The decision whether to treat must take into account this “benign” natural history, the potential benefits of treatment and the frequency of complications to classic anti-parasitic treatment. Studies have failed to show a reduction in duration of inflammatory activity, but some benefit in reducing retinal inflammatory lesion size.9 To date there are no effective treatments to eliminate chronic toxoplasmosis and the risk of recurrent chorioretinitis, which occurs in almost 49% of patients after 3 years9 and 80% after 5 years2. Treatment is not always indicated if the lesion is outside the posterior pole. Current practice is to treat all vision threatening cases and any person who is immunosuppressed. Classic “triple” therapy includes pyrimethamine, sulfadiazine and a systemic steroid. Clindamycin is often added (“quadruple therapy”). Intravitreal clindamycin and dexamethasone are other possible modalities particularly useful for recurrent attacks that avoid systemic complications. The use of corticosteroids is controversial. Treatment with corticosteroids without anti-parasitic cover is contraindicated due to the risk of allowing increased proliferation of the parasites, causing fulminant ocular toxoplasmosis.1,10 Their role and efficacy as an adjunct to anti-parasitic agents has yet to be determined by controlled clinical trials10,11. Toxoplasmosis is the most common cause of infectious posterior uveitis in Australia. Diagnosis is based mostly on clinical findings. Vitreous sampling with PCR testing is invaluable in atypical cases. Treatment must be individualised because medication side effects are common. Want to subscribe to the Retina Associates Case of the Month? Click here! Pavesio CE, Lightman S. Toxoplasma gondii and ocular toxoplasmosis: pathogenesis. Br J Ophthalmol. 1996;80:1099-1107. Bosch-Driessen et al. Ocular Toxoplasmosis Clinical Features and Prognosis of 154 Patients. Ophthalmology 2002; 109 (5):869-877. Furtado et al. Ocular toxoplasmosis I: parasitology, epidemiology and public health. Clin Exp Ophthalmol 2013; 41:82-94. Sullivan WJ, Jeffers V. FEMS. Mechanisms of Toxoplasma gondii persistence and latency. Microbiol Rev. 2012 May; 36(3): 717-733. Dubey JP, Lindsay DS, Speer CA. Structures of Toxoplasma gondii Tachyzoites, Bradyzoites, and Sporozoites and Biology and Development of Tissue Cysts. Clin Microbiol Rev 1998; 11(2): 267-299. Butler NJ et al. Ocular toxoplasmosis II: clinical features, pathology and management. Clin Exp Ophthalmol 2013; 41: 95-108. Kahloun R et al. Branch retinal artery occlusion associated with posterior uveitis. J Ophthalmic Inflamm Infect 2013, 3:16. Thomson PP, Kowalski RP. A 13-year retrospective review of polymerase chain reaction testing for infectious agents from ocular samples. Ophthalmology. 2011 Jul;118(7):1449-53. Rothova A et al. Therapy for Ocular Toxoplasmosis. Am J Ophthalmol 1993 April;115; 517-523. Bosch–Driessen EH, Rothova A. Sense and nonsense of corticosteroid administration in the treatment of ocular toxoplasmosis. Br J Ophthalmol 1998; 82:858-860. Care has been taken to confirm the accuracy of the information present and to describe generally accepted practices. However, the authors, editors, and publisher are not responsible for errors or omissions or for any consequences from application of the information and make no warranty, expressed or implied, with respect to the currency, completeness, or accuracy of the contents of the publication. Application of this information in a particular situation remains the professional responsibility of the practitioner; the clinical treatments described and recommended may not be considered absolute and universal recommendations.